"Indroduce english sentences (Book-2)" is prepared by P.Manohar Naidu sir. 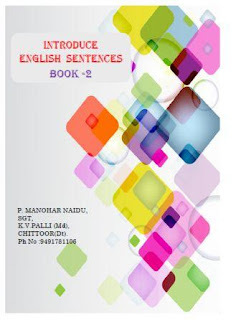 Indroduce english sentences book is useful for preprimary primary school childrens. It's also useful for anganavwadi childrens.This book is also useful for english remedial teaching, This book has been prepared keeping the all round development of language skills in young children.Every concept is designed with pictures to attract the attention of children and to help themsustain their interest in the learning process.Each concept has exercises related to four skills listening, speaking, reading and writing. Major role in this book listening and speaking activities. Questions and Answers are also introduce in this book for listening and speaking activities. This exercises will help the pupils in acquiring the knowledge of questioning.Wherever necessary the teacher can use this book for guidance and supplement these exercises.